Could you tell us a bit more about yourself? 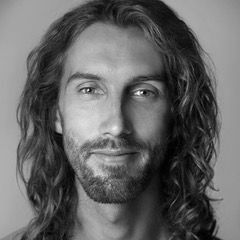 I’m a handpan maker based in Bristol, UK. I live at my workshop (a work/live space) with my dog, Hazel. I’ve been building handpans for 4 years and playing them for 6 years. I started adult life as a Law School graduate. I quickly decided that Law wasn’t for me and then trained and worked as a husky safari guide for 3 winters. During this time I also worked as a teacher of English language during the summer. I eventually trained as a primary school teacher, transferred to being a Steiner School Teacher and then started my own business, Meridian Handpans. What made you decide to start making handpans? How did it all begin? Before becoming a handpan maker I was a primary school teacher. In 2015 I lost my voice, and after 2 throat operations I was told I couldn’t teach anymore. I was literally speechless, and I needed something to occupy my time. 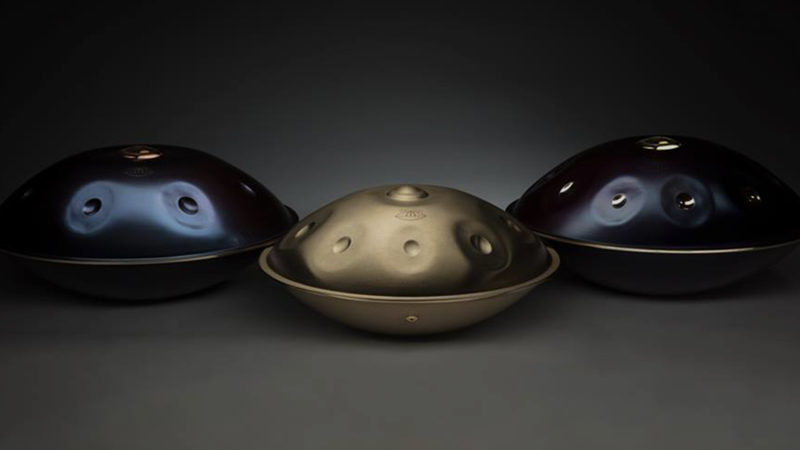 I’d been a handpan player for a couple of years and decided to try to make myself one as a distraction whilst I was unable to talk. I converted the back of my campervan into a workshop and each day I drove to the woods or the motorway to park-up and hammer steel for hours. Shortly after this I met Daryl Quinn (Panamor Handpans) who had also just started his journey as a student of steel. We started collaborating and shared tools, ideas, workshops and hugs when things weren’t going well! After 8 months of blood, sweat and tears I made my first prototype. I’d planned to keep it for myself, but I had so much interest that I ended up selling it and using the money to buy a compressor and pay the first month’s rent on a real workshop where I began to work full-time as a handpan maker. How did you find the name for your instruments? What do you like the most about handpans? About our community? I like how accessible handpans are as an instrument. They’re very intuitive, easy to play simply and yet challenging to play like a professional. Also, the variety of scales, makers and adaptations means that there’s so much variety within the instrument. I think that in order for strangers to become friends, all they need is one thing in common. An interest in handpans is the common link between everyone in the ‘community’ and it has helped to create countless friendships and a strong family atmosphere in a growing fanbase. 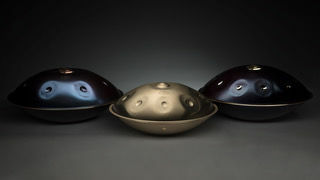 I like many things about being a handpan maker. However, one of my favourite things is the constant feeling of discovery. Being such a young instrument, there is still so much innovation and exploration to be done. Seeking perfection at every step. I feel that every opportunity should be taken to make the instrument not just sound, but also look as beautiful as possible. Tell us about your latest creation, what’s so special about it? For the last year I’ve been working hard researching and developing my new electro-acoustic Meridian Traveller instrument. 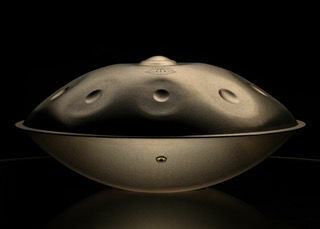 It’s an 18” brushed-stainless handpan with a unique custom-made pickup system of my own design built in. The intention was to create the perfect instrument for the travelling musician; light, tough, loud, rust-resistant and easily amplifiable. How can we purchase an instrument from you? How does it work? Waiting list? Flash sales? By email? etc. Since 2016 I’ve operated a waiting list. The list is still open and can be joined via my website or FaceBook Page. I hope to also be able to offer a limited number of Meridian for immediate purchase in the future when time allows. I feel that anyone who wants to make handpans for the right reasons should be encouraged. A piece of advice I’d give to anyone who has recently become a student of steel is to make a prototype first, regardless of the quality, before approaching established makers for help and guidance. If you visit a maker at the beginning of your journey and ask where to begin, they may give you some general recommendations of how to start. However, if you bring a prototype which you have created, they have so much more to base their recommendations on and will be able to give much better advice on how to progress and improve. Your website? 2 or 3 best videos of your instruments?